Position the rebounder upright or open with the legs in place (as if you were going to jump on the rebounder). Each spring cover has two hinge patches. One of the patches has a seam where the fabric and internal banding join. Each spring cover has 8 hook & loop straps. Two are located at the hinge patch and 6 are located at the leg positions. Hook & Loop is a material very similar to Velcro™, however it is a two sided material with the rough hooks on one side and soft loops which grab the hooks on the other. 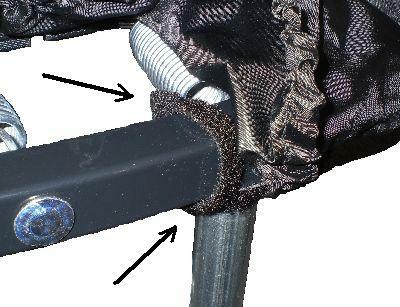 Center the seamed hinge patch above a hinge (over the frame seam on a non-folding rebounder) and wrap the hook & loop strap nearest the legs around the frame to the left of the adjacent leg on the left and the right of the leg adjacent on the right. This allows maximum movement of the internal banding of the spring cover. Wrap the hook & loop strap under and around the frame back onto itself. This photo illustrates the hook & loop strap to the left of a leg. Continue around the frame wrapping each hook & loop strap until all 6 near the legs are in place. If you have a folding rebounder, the hook & loop straps at the hinge are left loose at this time. If you have a solid frame rebounder, the straps may be wrapped around the frame. Adjust the lower band of the spring cover under the frame. NOTE: Some people install the spring cover by wrapping the hook & loop straps around the leg tube instead of the frame. This is acceptable as long as the spring cover is installed with the legs in position as shown at left. However, if the leg tubes are released for folding, they may pinch the hook & loop strap between the frame and leg tube making the unit unstable and damage the hook & loop strap. 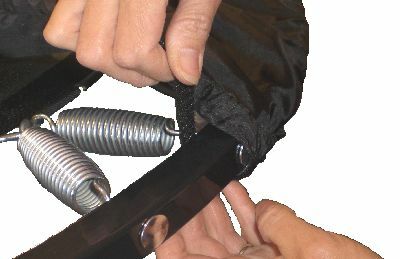 If this method is used we would suggest complete removal of the spring cover before folding. 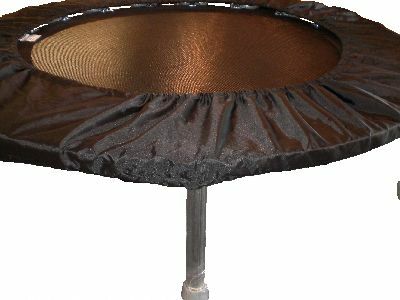 Whenever a rebounder is to be opened or closed, the velcro type straps must be around the spring cover first.